Today Vice Prime Minister for European and International Integration Hryhoriy Nemyrya held a meeting with American investors. Hryhoriy Nemyrya told investors about basic principles of the Government Action Program “Ukrainian breakthrough: not for politicians, but for the people" and key elements of Transparency Initiatives of Prime Minister of Ukraine Yulia Tymoshenko which had been proclaimed during her meeting with investors last week. Hryhoriy Nemyrya stressed that Transparency Initiatives reflect philosophy of the new Government of Ukraine and include, in particular, introduction of the transparent system of Ukrainian justice, transparent suffrage legislation, transparent and accountable power and opposition, transparent relations of power and business, transparent taxes (simplified tax system excluding chances for evasion) and transparent VAT return, etc. The Vice Prime Minister also told about Ukraine’s advancement toward the WTO, expressing hope that a final decision on accession would be taken at the WTO General Council session on February 5. It is expected that after Ukraine accedes to the WTO the official negotiations on overall deep free trade area between Ukraine and the EU will be launched already in February. “This is a serious achievement of the new Government and a sign which demonstrates a policy of resolute reforms by the Tymoshenko Cabinet,” Hryhoriy Nemyrya stated. In their turn, investors congratulated the Vice Prime Minister on successful completion of negotiations on accession to the WTO and made suggestions on a new Council of Investors which starts its activity soon. 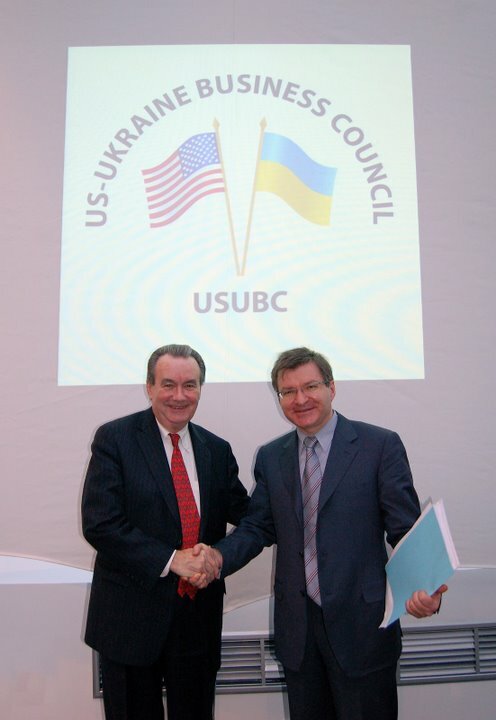 The meeting, organized by the US-Ukraine Business Council, was also attended by representatives of the American Chamber of Commerce, Microsoft, Baker&McKenzie, Cargill and DHL.